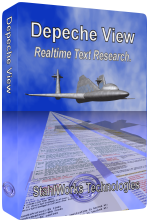 Depeche View for Windows XP / Vista / 7. 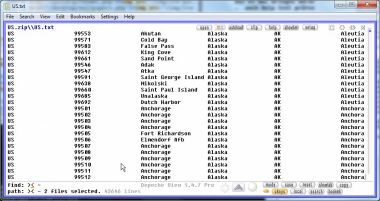 Depeche View is a high speed text search application that can search TAB separated database exports from databases or spreadsheet applications in realtime. It allows to search words as you type, or by clicking on words already present on screen, producing result lists instantly. A typical scenario is to check address data for correctness. 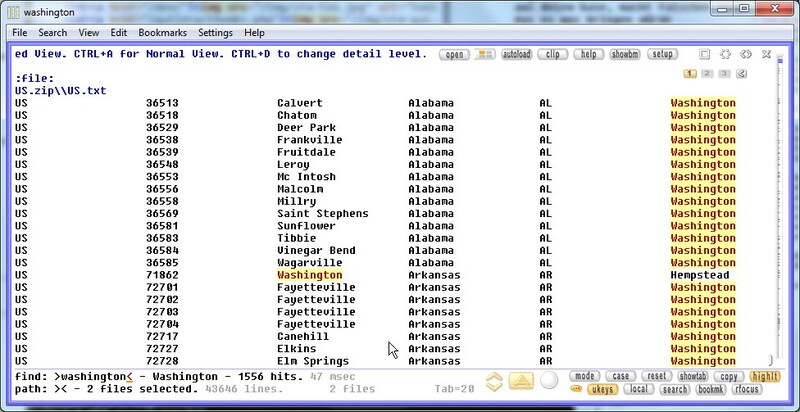 In the screenshot to the right, a database of zip codes, or postal codes, taken from geonames.org was loaded with Depeche View Pro. The database provides country code, postal code, place name, state, county and community as tab separated columns. I press CONTROL+SHIFT+TAB in Depeche View to select a large tab size of 20, for a better display of the columns. I right click on the button to activate AutoFilter mode . 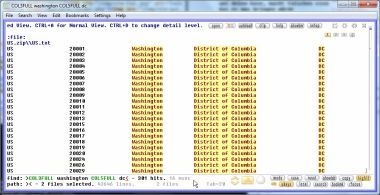 This means: whenever I type a word, the tool will present a list of only the text lines containing that word (a filtered view). 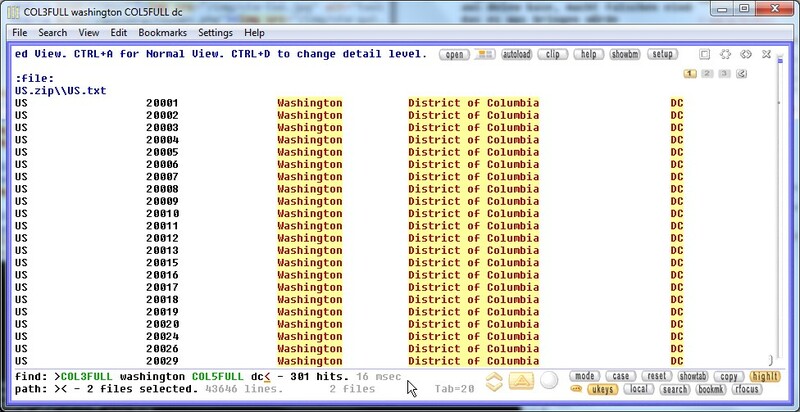 Now let's type, for example, "Washington". I get 1556 hits instantly - every database record containting that word. But actually I meant the city Washington, not every city within a state, county or province named Washington. and get all zip codes from exactly that city. As you can see, the main principle of Depeche View is simplicity. It does NOT use complicated regular expressions, but plain English search operators like AND, OR, NOT, or COL for column. Furthermore Depeche View allows to search words by a single click on a word, either in the same window, or through a right click in a different window. This allows high speed jumping between different table contents. Another major feature is clipboard automation: let Depeche View run in parallel to your spreadsheet application, and whenever you copy a word into the clipboard, let Depeche View run an automated search in it's text data. This and more can be tried immediately by downloading the free Depeche View Pro Demo.